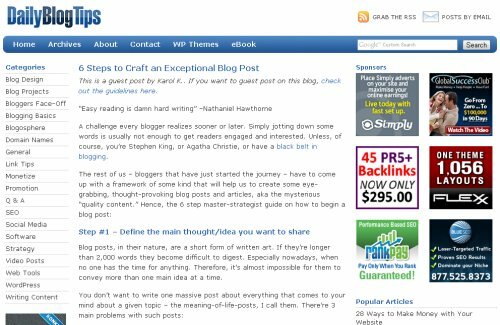 Having a great idea alone is usually not enough to write an exceptional blog post. I’m no blogging-guru, so don’t get me wrong, but I do think that you also need to have some technical aspects of creating a blog post in place. These technical aspects create a kind of framework that can be very helpful once you’re sitting in front of a blank screen and scratching your head, wondering how to start writing. Check out my guest post at Daily Blog Tips to learn more. Also, be careful not to publish your post prematurely. Lastly, every blogger needs traffic (duh!). Here’s a list of over 9,000,000 blog traffic sources, feel free to check it out.